We all love cooking and recipe videos, it is the easiest way to learn how to cook your favorite dishes. Filming cooking videos, on the other hand, requires knowledge and experience with a camera. There are many filming tricks of the trade to make your recipe video informative, engaging, entertaining, and most importantly, showcasing your delicious food to your viewers. – Wise Youtubers learn from the experience of others. 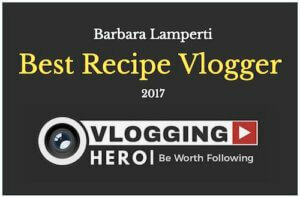 We asked Barbara from Buonapappa to give us advice on how she creates her recipe/cooking videos. 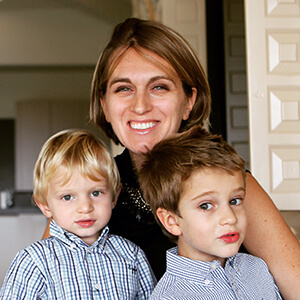 Buonapappa is a cooking YouTube Channel run by Barbara Lamperti, an Italian mother of 2, YouTube personality and an incredible cook! 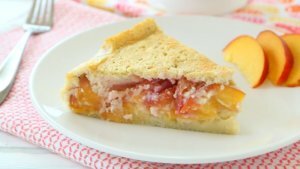 Barbara’s YouTube channel provides recipes to create delicious dishes and for the whole family and filmed in her own kitchen. 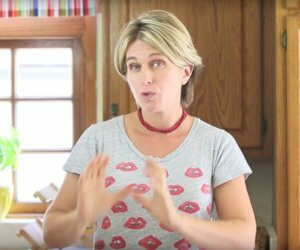 Barbara has a cheerful, fun, entertaining style and her videos and food creations are fantastic. Take a look for yourself. All the items in this list are used by Barbara to create her videos. They are all links and can be clicked to see the product. Barbara concentrates on giving value to her subscribers. Not only does she share creative Italian-inspired cooking recipes but she has taken the time to deliver these recipes in an engaging filming style that requires thoughtful planning and clever techniques. 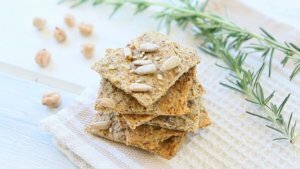 Barbara ticks all the right boxes when it comes to making recipe videos, innovative foods, clear instructions, beautifully presented foods and delivered in an enjoyable style. In our opinion she the perfect role-model to teach the rest of us how to make our own cooking vlogs. Barbara’s lighting is great! She really knows how to make the most of natural light and using some additional light stands to balance the light on the shaded sides, not only does it make her kitchen look fab, it makes her pop out from her environment and keeps the focus firmly on Barbara. See the below pic (sorry Barbara, we took an action shot when you were in the middle of explaining Halloween fishcakes). An idealist might say that it’s too much light, but YouTube is all about grabbing attention and keeping your viewers focused before the get distracted by another funny cat video, better more light than not enough. 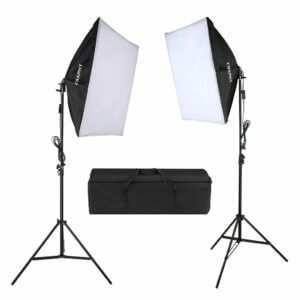 Barbara is using softbox lights, you can buy a similar lighting kit to Barbara’s at a reasonable price of $70-$100. See an example below of the type of kits you can buy, they normally extend to a height of 6ft easily, really useful kit. Super important for all cooking or recipe videos, the final result, the hook, the reason that people watch the video in the first place, usually showcased at the beginning of the video to entice the viewer to watch the rest of your video. You need to give movement… taking a bite of the slice of cake, the grating of the cheese and the drizzle of honey on the pancake… That is what makes your audiences mouth water. See how effective that is in the video below. The final result, your Gorgeous foods are best presented in the most naturally lit area of your of your kitchen or set, Barbara uses a DIY presentation set made really simply made of a whiteboard(to reflect light back onto the dish) and some decorative wood as a base. The make-shift set is arranged on her breakfast table to showcase her finished dish and they always look amazing. The pink arrows show the light directions, the small arrow indicating the reflected light, giving the same effect as the light stands, the make your strawberry cheesecake pop out of the frame. 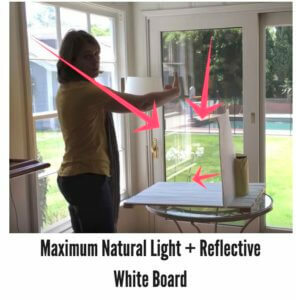 Add a couple of household decorative items, with natural light and reflective board, creates this….Stunning! Every one of Barbaras Beauty shots are Instagram Worthy! Timing is important and changing between scenes keeps viewers attention, the next time you watch a tv commercial, notice how many times the frame/camera angle changes, youtube is similar to commercials in that the value is in maintain viewers attention and stopping them from getting bored and clicking away. Youtube monitors this and will reward you by increasing your exposure if you can increase ‘on page time’. Barbara shows us how she records her videos and gives us a good example of where to positioning your camera(s), this is great information because you can spend all day trying different positions to see what works. If you like Barbara’s camera angles in Buonapappa, just copy what she did in her tutorial video and save yourself a lot of time. 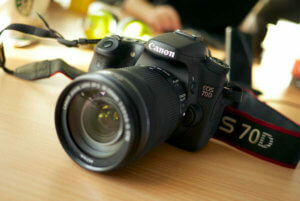 Regarding cameras, Barbara uses the Canon EOS 70D, which is also our favorite camera. The 70Dt does everything you need; a wonderful articulated screen, easy to use (for a DSLR), takes good quality images and is used by so many of the most famous YouTubers. We didn’t want to show you a studio example, most YouTubers make their videos on a modest budget and don’t usually have an entourage of people helping them. Barbara literally makes her videos at home on her own and does an excellent job, backed by her 42k and growing subscribers. Likeability is a very important aspect for vloggers, sounds obvious but being likable is crucial if people are going to subscribe and keep watching your videos. What works best for cooking and mother figures is be humble, authentic and represent yourself in a way that builds trust with your audience. Barbara does this really well and always opens with lots of smiling. Don’t talk about yourself for too long! Remember what your audience are watching your recipe video for, it is to see how to cook something, your role is to be a pleasant communicator of information, if you are adding unnecessary information then make sure it either gives value or is entertaining. Voice clarity and sounds are important, other than sight, audio is the only other way we enjoy YouTube videos, therefore we should give our audio quality the same level of attention as the visuals. Try to introduce many different sounds in your videos as well as changing visual frames in order to maintain viewer attention. Vlogging Tip: When you are editing, it is good to change frame or camera angle when there is a sound spike or strong word. Words that start with a letter ‘P’ are good to change frames on, because they ‘P’ack a ‘P’unch, trust us it will look a lot more natural. Use an external mic, it may sound ‘ok’ but when you are continuously listening to high-quality audio on most videos, then when we start watching your video, we hear that hollow tinny sound of an inbuilt camera microphone and it is not as enjoyable to watch. Click Here to check out our article on the best external microphones to bring quality to your videos. We award you the best recipe vlogger of 2017. 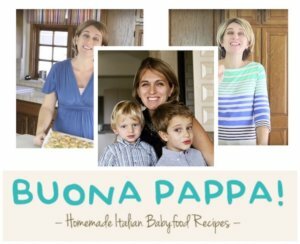 Click the Buonapappa Banner below to visit Barbara’s Youtube Channel to see more great recipes, new recipes are released every Thursday.